Silk O'Loughlin was an American League umpire for 17 years, from 1902 to 1918. He umpired 31 games in the 1906, 1909, 1912, 1915 and 1917 World Series. His baseball career ended when he died in the Spanish Flu pandemic at age 48 and he is buried at Holy Sepulchre Cemetery in Rochester, NY. Born in an Irish immigrant family, Silk O'Loughlin played amateur baseball in the Rochester area as a young man. 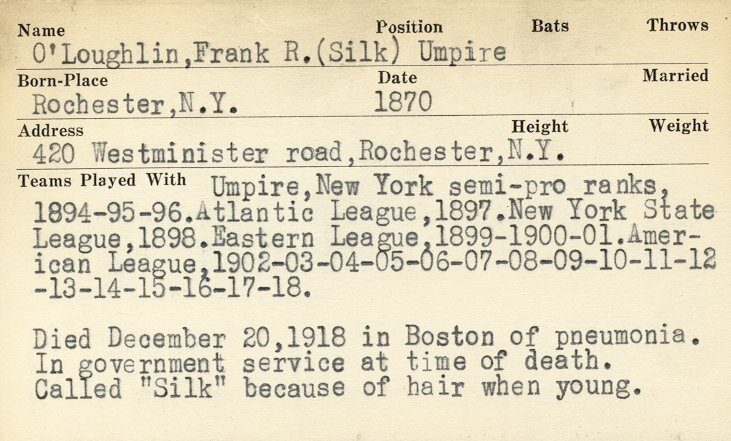 He was asked to umpire some games in 1895, liked the experience, and by 1897 was earning his keep as a full-time umpire in the Atlantic League. He moved to the New York State League later that season, in order to be closer to his home, and then in 1898 was hired by the Eastern League, one of the top minor leagues of the time. In 1902, American League president Ban Johnson offered him a contract to work in the Major Leagues. Silk O'Loughlin loved the spotlight as an umpire, and was convinced of his superior skill: "A man is always out or safe, or it is a ball or a strike. The umpire, if he is a good man and knows his business, is always right. I am always right." And if anyone doubted his infalibility, he would be quick to eject him from the game. He had a strong booming voice, which could be heard throughout the ballparks where he made his calls. He was a sharp dresser, and introduced the fashion of umpires wearing sharply creased trousers on the field. His personality stuck out in the American League, where Ban Johnson had tried to recruit umpires like Tom Connolly who would inspire respect through their even character and fairness, and would keep out of the limelight and not pick fights with players. O'Loughlin was a throwback to an earlier time, where umpires were loud and opinionated and depended on their sharp tongue and wit to keep order on the field; he was beloved by the fans and sportswriters as a result. "Silk is a national institution", one reporter declared in 1910, "his 'Strike Tuh!' call is known from one end of the land to the other." After the war-shortened 1918 season, he found an off-season job as a security guard in Boston, MA's munition works and shipyards, and was working there when he became a victim of the influenza pandemic which swept across North America. His wife Agnes Swift, whom he had married in 1905, survived, but O'Loughlin died on December 20, 1918. Stump Wiedman was his brother-in-law. David Anderson: "Francis 'Silk' O'Loughlin", in David Jones, ed. : Deadball Stars of the American League, SABR, Potomac Books, Inc., Dulles, VA, 2006, pp. 395-396. This page was last edited on 2 June 2018, at 23:55.